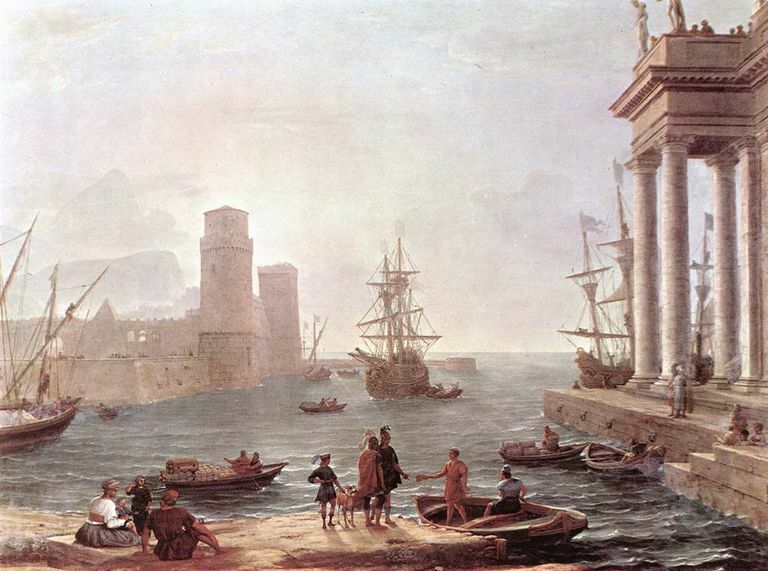 Claude Lorrain, "Port Scene with the Departure of Odysseus from the Land of the Phaeacians" (1646). The Odyssey first appeared in English in the 17th century and has been translated more than sixty times. Many of the words and phrases employed by Homer are open to a wide range of interpretation, causing not-insignificant differences between translations. Date Published: Composed during the 8th century B.C.E. At the start of The Odyssey, the author addresses the Muse, asking her to tell him about Odysseus, the hero who spent more time traveling back to his Greek home than any other Greek hero at the Trojan War. Odysseus has been kept captive by the goddess Calypso. The other gods, except Poseidon (god of the sea) fell sympathy for Odysseus. Poseidon hates him because he blinded his son, Polyphemus. The goddess Athena, Odysseus’ protector, convinces her father, Zeus, that Odysseus needs assistance. She disguises herself and travels to Greece to meet with Odysseus’ son, Telemachus. Telemachus is unhappy because his home is beset by suitors who want to marry his mother, Penelope, and take over Odysseus' throne. With Athena's help, Telemachus sets out to search for his father. He visits other veterans of the Trojan War, and one of his father’s old comrades, Menelaus, tells him that Odysseus is being held by Calypso. Meanwhile, Calypso finally releases Odysseus. Odysseus sets out on a boat, but the vessel is soon destroyed by Poseidon, who harbors a grudge against Odysseus. Odysseus swims to a nearby island where he is warmly greeted by King Alcinous and Queen Arete of the Phaeacians. There, Odysseus recounts the story of his journey. Odysseus explains that he and his companions left Troy on twelve ships. They visited the island of the lotus-eaters and were captured by the cyclops Polyphemus, son of Poseidon. When making an escape, Odysseus blinded Polyphemus, inspiring Poseidon's wrath as a result. Next, the men nearly made it home, but were blown off course. They first encountered a cannibal, and then the witch Circe, who turned half of Odysseus' men into pigs but spared Odysseus thanks to the protection provided to him by the sympathetic gods. After one year, Odysseus and his men left Circe and reached the edge of the world, where Odysseus summoned spirits for advice and learned of the suitors living in his home. Odysseus and his men made their way past more threats, including the Sirens, a many-headed sea monster, and an enormous whirlpool. Hungry, they ignored warnings and hunted the sacred cattle of the god Helios; as a result, they were punished with yet another shipwreck, stranding Odysseus on Calypso’s island. After Odysseus tells his story, the Phaeacians help Odysseus disguise himself and travel home at last. Upon returning to Ithaca, Odysseus meets his son Telemachus, and the two men agree that the suitors must be killed. Odysseus' wife Penelope arranges for an archery competition, which she has rigged to guarantee Odysseus' win. After winning the competition, Odysseus slaughters the suitors and reveals his true identity, which Penelope accepts after putting him through one final trial. Finally, Athena saves Odysseus from the vengeance of the dead suitors' families. Odysseus. Odysseus, a Greek warrior, is the protagonist of the poem. His journey home to Ithaca after the Trojan War is the primary narrative of the poem. He is a somewhat non-traditional hero, as he is known more for his cleverness and cunning than his physical strength. Telemachus. Telemachus, the son of Odysseus, was an infant when his father left Ithaca. In the poem, Telemachus goes on a quest to figure out his father's whereabouts. He ultimately reunites with his father and helps him kill Penelope's suitors. Penelope. Penelope is the loyal wife of Odysseus and mother of Telemachus. Her cleverness equals that of her husband. During Odysseus' 20-year absence, she devises numerous tricks to stave off the suitors who seek to marry her and gain power over Ithaca. Poseidon. Poseidon is the god of the sea. He is angry with Odysseus for blinding his son, the cyclops Polyphemus, and makes various attempts to hinder Odysseus' journey home. He can be considered Odysseus' primary antagonist. Athena. Athena is the goddess of cunning and intelligent warfare, as well as the crafts (e.g. weaving). She favors Odysseus and his family, and she actively helps Telemachus and advises Penelope. As an epic poem written in the 8th century B.C.E., The Odyssey was almost certainly intended to be spoken, not read. It was composed in an ancient form of Greek known as Homeric Greek, a poetic dialect specific to poetic compositions. The poem is composed in dactylic hexameter (sometimes referred to as epic meter). The Odyssey begins in media res, starting off in the middle of the action and providing expository details later. The non-linear plot leaps back and forth in time. The poem employs flashbacks and poems-within-a-poem to fill in these gaps. Another key feature of the poem's style is the use of epithets: fixed phrases and adjectives that are often repeated when a character's name is mentioned—e.g. "bright-eyed Athena." These epithets serve to remind the reader about the character's most important essential traits. The poem is also notable for its sexual politics in that the plot is driven as much by the decisions made by women as it is by male warriors. In fact, many of the men in the story, like Odysseus and his son Telemachus, are passive and frustrated through much of the story. By contrast, Penelope and Athena take numerous active steps to protect Ithaca and assist Odysseus and his family. There is some disagreement about Homer’s authorship of The Odyssey﻿. Most ancient accounts refer to Homer as a blind poet from Ionia, but today's scholars believe more than one poet worked on what we know today as The Odyssey. Indeed, there is evidence that the final section of the poem was added much later than the previous books. Today, most scholars accept that The Odyssey is the product of several sources that were worked on by several different contributors. “The Odyssey - Homer - Ancient Greece - Classical Literature.” Oedipus the King - Sophocles - Ancient Greece - Classical Literature, www.ancient-literature.com/greece_homer_odyssey.html. Mason, Wyatt. “The First Woman to Translate the 'Odyssey' Into English.” The New York Times, The New York Times, 2 Nov. 2017, www.nytimes.com/2017/11/02/magazine/the-first-woman-to-translate-the-odyssey-into-english.html. Athens, AFP in. “Ancient Find May Be Earliest Extract of Epic Homer Poem Odyssey.” The Guardian, Guardian News and Media, 10 July 2018, www.theguardian.com/books/2018/jul/10/earliest-extract-of-homers-epic-poem-odyssey-unearthed. Mackie, Chris. “Guide to the Classics: Homer's Odyssey.” The Conversation, The Conversation, 15 July 2018, theconversation.com/guide-to-the-classics-homers-odyssey-82911. “Odyssey.” Wikipedia, Wikimedia Foundation, 13 July 2018, en.wikipedia.org/wiki/Odyssey#Structure. Who is Polyphemus and What Did He Do? Which Gods and Goddesses Are Characters in Homer's Iliad? Who Were the Major Figures of the Trojan War? What Is a Homeric Epithet?